I’ve been feverishly trying to get a few things done before I start posting photos again (a big incentive for me, considering I was significantly behind in posting, and now…. I am LIGHT YEARS behind). The oodles of pics I have are finally organized into folders instead of one humongous mess. During my obsession to become organized, I had launched two lists: Beer Festivals and Restaurant Weeks. I had a 3rd “list” planned (unique food events) but it would be a doozy and I’m not so sure I want to use my time compiling yet another list when I have thousands of photos waiting to take up residence on my blog. If all else fails, I’ll somehow incorporate the information I already have into the two lists. Enough of the boring mechanics of this blog. I know, you want to see food. And believe me, I’m ready to begin posting the mouthwatering pics of desserts and dinners Chip and I devoured. 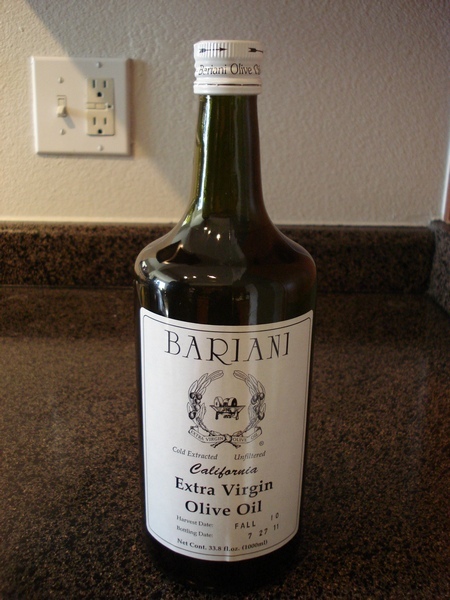 Lemme start with my favorite olive oil, only because some of my recipes call for olive oil, and this golden oil is what I pour onto the garbanzo beans and tahini while making Hummus (I’ll post the recipe soon, promise). It took a slight bit of “research” on my part a few years back. 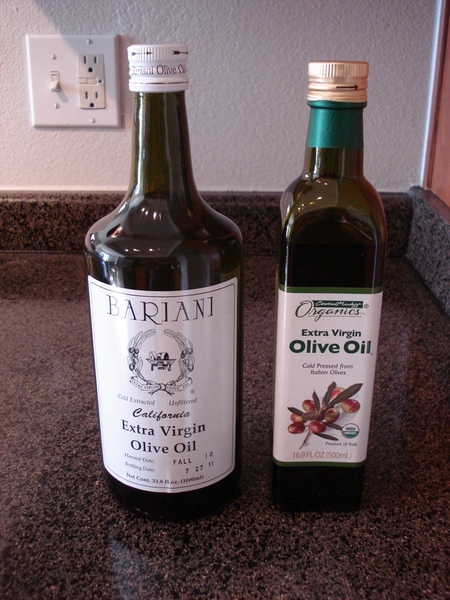 ‘Twas important for me to know what to look for in choosing GOOD olive oil. 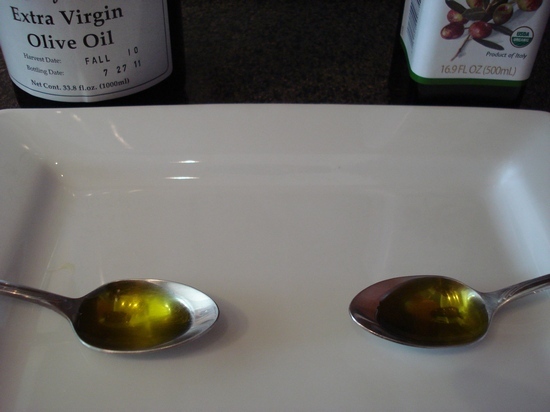 (Are the ones in health food stores like Whole Foods better than grocery stores? 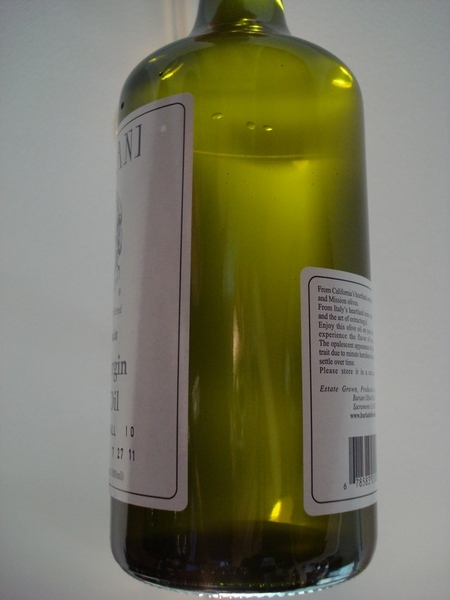 Do I look for oil manufactured in a particular country like Italy or perhaps Spain? Do I choose one in glass or plastic or tin can?) I wanted answers…and yes, I can handle the truth. (Cue: A Food Good Men). I got super lucky ’cause I came across an article that pretty much answered any questions I could have. The article also recommended a particular brand, so I didn’t have much research to do after that (not that I mind research, mind you…but gettin’ good info handed to you is *always* nice). Yessssss, a showdown! Just kidding! Notice how they look exactly the same?! 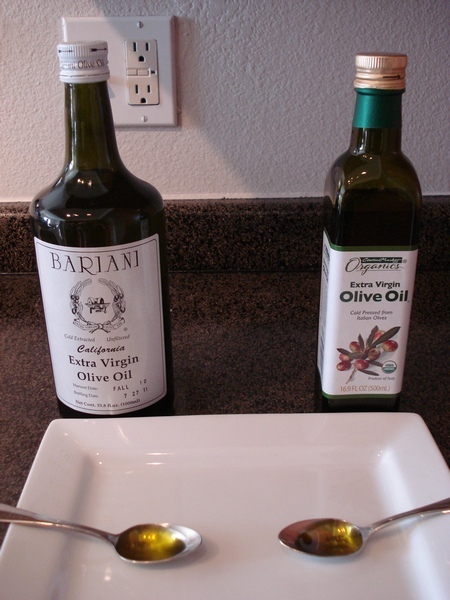 Alas, Bariani tastes more peppery, and just knowing we’re consuming good, yummy olive oils is hella awesome! Stick around ’cause I’m pumped to start churning out posts.